What Makes Stainless Steel Turn Blue in the Dishwasher? Stainless steel is a popular choice for cookware and cutlery due to its durability and sleek appearance. Stainless steel's economical price makes it an affordable option for both residential and commercial kitchens. However, stainless steel is susceptible to color changes – in particular, it has a tendency to take on a blue tint in an automatic dishwasher. Mixing chromed steel, stainless steel and silver-plated steel can produce chemical reactions. To be classified as stainless steel, cookware and cutlery must contain a minimum of 10.5 percent chromium. A higher percentage of chromium -- and other elements like nickel -- results in a higher level of corrosion and staining protection. For example, "18/8" stainless steel is 18 percent chromium and 8 percent nickel; whereas "18/10" stainless steel is 18 percent chromium and 10 percent nickel. 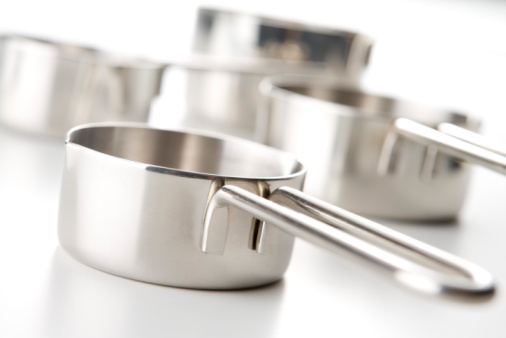 According to the Health Craft Cookware website, in 18/8 stainless steel, the 18 percent chromium and 8 percent nickel totals only 26 percent. This means the remaining 74 percent of the material is other substances, which may or may not be durable elements like titanium and vanadium. Health Craft states that stainless steel made outside the United States is prone to turn blue – as well as grey or black -- and is more susceptible to rust, corrosion and warping because it is not composed of quality materials. Stainless steel cutlery and cookware can turn blue as a result of detergents in a dishwasher. Sheffield Cutlery warns against using stainless cutlery in dishwashers due to "detergent bloom," a condition that refers to a dishwasher's inability to properly rinse detergent from the machine's contents. This results in a blue tarnish on stainless steel items. Using too much rinse aid will also produce detergent bloom. 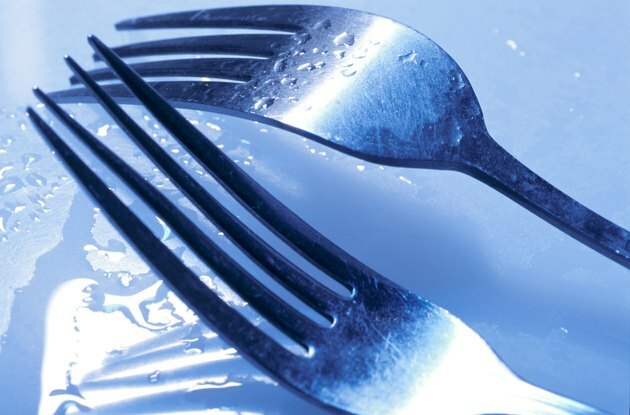 The mixture of hot water and detergent chemicals can produce discoloration on stainless steel cutlery. The Solex cutlery company advises against mixing chromed steel, stainless steel and silver-plated steel in the dishwasher, as the variety of metals can cause chemical reactions that results in blue spots. There are several steps you can take to reduce the possibility of stainless steel turning blue in the dishwasher. Rinse salty foods as well as foods with high-acid contents – such as salad dressing or fruit – from stainless steel items before placing them in the dishwasher to reduce chemical reactions. In addition, don't over-pack the cutlery basket; leave space to allow room for all utensils to be properly washed and rinsed. Don't let dishwasher detergent spill on cutlery and cookware since full-strength dishwasher detergent, which is much stronger than the mild dish soap you use in the sink, may be too strong. Also, soaking blue-tinted items in vinegar for 10 minutes – followed by rinsing – may help restore the original color. What Causes Blue Stains on Laundry? Why Is Stuff Turning Orange in My Dishwasher?